Stonyfield Farm | Healthy Product Reviews!! Stonyfield Farm, as you all should know, makes dozens of products ranging from organic/all natural yogurts, frozen desserts and smoothies. They all benefit the earth and are made using only nature’s finest ingredients. I personally love their yogurt, and I’ve passed by the Banilla flavored yogurt way too many times in the store, simply because it was in the 32 oz. cup instead of the individual cups. For conveinence, of course, I usually only buy the individual 6 oz. cups, plus it is easy portion control. 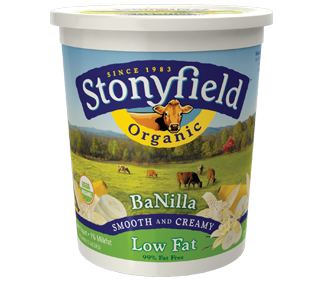 However, I decided I was in the mood for a new flavor of yogurt, and Stonyfield has never let me down before, so I decided to give Banilla a try. So i took home the 32 oz. “cup” of yogurt and took out a spoon from my cupboard. I took a scoop and instantly fell in love. My taste-buds rejoiced upon tasting this yogurt. THIS WAS MY NEW FAVORITE FLAVOR! I was actually, to be honest, a little mad at myself for not buying it any sooner just because it was in the 32 oz. size instead of the 6 oz. 1. Banilla Yogurt, Trader Joe’s Chocolate Toucan cookies, sliced bananas, and a squirt of whipped cream. 2.Banilla Yogurt, Kashi Go Lean Crunch Cereal, sliced bananas, and some organic chocolate syrup. 3.Banilla Yogurt, Kashi Honey Puffs and a Kashi Dark Chocolate cookie. The possibilities are endless! I’m planning on freezing some soon and maybe mixing it with some peanut butter. Yum!! I will definietly keep buying this flavor, (and secretly wish they transfer it to the 6 oz variety!!) especially with the MyStonyField Rewards program, it is worth 4 points per lid! 1 cup is 200 calories, 2.5 grams of fat, 35 carbohydrates, 0 grams of fiber, 9 grams of protein and 35% daily value of calcium + tons of probiotics! CULTURED PASTEURIZED ORGANIC LOW FAT MILK, NATURALLY MILLED ORGANIC SUGAR, ORGANIC BANANA PURÉE, NATURAL FLAVOR, ORGANIC NATURAL VANILLA FLAVOR, TURMERIC (FOR COLOR), PECTIN, VITAMIN D3. CONTAINS OUR EXCLUSIVE BLEND OF SIX LIVE ACTIVE CULTURES: S. THERMOPHILUS, L. BULGARICUS, L. ACIDOPHILUS, BIFIDUS, L. CASEI, AND L. RHAMNOSUS. Stonyfield Farm is my “go to” brand for yogurt. They have made a branch, so to speak, of organic greek yogurt, Oikos Organic Greek Yogurts. I like greek yogurt usually, but it’s bland tasting, and needs some flavor in my opinion, may it be fruit or granola or SOMETHING. Oikos has flavored yogurts, with honey, vanilla, strawberry and blueberry. I decided to use my free coupon provided generously by Stonyfield Farm and bought the Honey flavor. So, 3 o clock rolls around and i am famished. I had a good workout at the gym today, so i’ve been craving protein all day long. Instead of my normal snack, i grabbed the Oikos Honey Organic Greek Yogurt out of my fridge. Greek yogurt is thicker than regular yogurt, and has almost double the protein. Opening my container, it was greek yogurt on top, honey on the bottom. Without mixing, the yogurt part tastes sweet. It’s really thick and creamy, with a sour cream like consistency. It’s slightly tangy, but the honey’s sweetness “leaked”, so it’s not too tart like plain greek yogurt. Onto the honey part, i know what your thinking. Honey? Isn’t it too thick? Nope. This isn’t your straight up “honey” from a jar- it’s more liquidy and has a jelly-like consistency. It’s almost like honey applesauce on the bottom. By itself it also isn’t as sweet as PURE honey, so it’s not overpowering. It’s a nice compliment to the greek yogurt. I didn’t completely mix mine, but i would just take a scoop and half my spoon would be honey, half yogurt. Delicious! 1 cup is 120 calories, 0 grams of fat, 18 grams of carbohydrates, 0 grams of fiber, and 13 grams of filling protein. CULTURED PASTEURIZED ORGANIC NONFAT MILK, ORGANIC HONEY, ORGANIC SUGAR, PECTIN, ORGANIC CAROB BEAN GUM. Let’s start with Wallaby. I tried the “Down Under” Variety, which has a bunch of fruit chunks/juice on the bottom, and then creamy lowfat yogurt on top. It comes in 6 flavors, but i picked up the Strawberries & Cream Flavor. Now how should i approach this? Do i have the yogurt part separately? Then the fruit? Should i stir it like most fruit on the bottom yogurts? I decided to have it separately. The yogurt itself is silky, smooth and sweet. It’s not runny like some lowfat/nonfat yogurts can be. On the bottom there are large chunks of strawberries. They are soft, and taste like the kind you eat after frozen berries were left to thaw a little bit. Now for the full experience, the fruit with the yogurt- delicious! The flavor reminds me of strawberry Cremesavers, that hard candy that used to be popular a couple years ago. It was goooooooood. Who doesn’t like strawberries & cream? Each cup is 140 calories, 2 grams of fat, 25 carbohydrates, 0 fiber, and 6 grams of protein. It was definitely delicious and a substantial snack. Organic cultured pasteurized reduced fat milk, organic strawberries, organic evaporated cane juice, organic flavors, pectin, organic locust bean gum. Now on to Stonyfield Farm- a new flavor i saw popped up at my local grocery store. People’s Choice Pomegranate Berry. It was a blended yogurt, so it was sweetened with berry juices not fruit chunks. How did this berry yogurt live up? Just as good! It was creamy and light tasting, and not overly sweet at all. It was very “pomegranate-y” if you will. It has a nice blended taste of blueberry and strawberry flavors as well. I don’t know if it was just me, but it took me a longer time than usual to eat this yogurt. It felt fuller, more dense, creamier than other nonfat yogurts. A+ in my book! Each cup is 130 calories, 0 grams fat, 25 carbohydrates, 0 fiber and 7 grams of protein. I agree with the “people”- eat this yogurt! Cultured Pasteurized Organic Nonfat Milk, Naturally Milled Organic Sugar, Organic Pomegranate Juice from Concentrate, Organic Strawberry Juice from Concentrate, Pectin, Natural Flavor, Organic Carrot Juice Concentrate (for Color), Vitamin D3. We all know how much I love yogurt. Creamy, flavored, plain, fruit on the bottom- I just love it! I also LOVE frozen yogurt. Red Mango is a place by me that makes good frozen yogurt-but it’s kind of far away. So, i was at Whole Foods yesterday and i bought Stonyfield Farm Organic Frozen Yogurt in the Cookies ‘n Dream flavor. I figured why not? So today, as 3 o clock rolled around and my tummy began grumbling for something, i was about to reach for my usual, some soy crisps or a flavored yogurt, but -aha!- i have my frozen yogurt i can try! So i pulled out the container and took a couple big scoops and plopped them into the bowl. It looked promising-just like ice cream. But how did it taste? I took a nibble of the cookie wafer part- delicious! It tasted just like the chocolate cookie part of an oreo-just frozen. There were a lot of cookie chunks throughout the container as well-Stonyfield doesn’t scrimp at all and that’s a good thing! The frozen yogurt as a whole was amazing. It was creamy, melty, sweet but not overpoweringly sweet like some companies make their products. The cookie pieces were the best part. I made sure i picked a lot of those out when scooping out of the container (yes i am one of those people- like when you buy cookie dough ice cream and you make sure every spoonful you take out of the carton has some cookie dough in it-leaving little for the next person!! )It tasted sinful-but it wasn’t! It was lowfat AND had beneficial probiotics for my digestive system, along with 15% of my daily calcium needs in a 1/2 cup serving. Nice! I definitely felt good eating this- it was yummy AND good for me! CULTURED PASTEURIZED ORGANIC NONFAT MILK, NATURALLY MILLED ORGANIC SUGAR, ORGANIC CHOCOLATE COOKIES (ORGANIC WHEAT FLOUR, ORGANIC EVAPORATED CANE JUICE, ORGANIC PALM OIL, ORGANIC BLACK COCOA, WATER, ORGANIC INVERT CANE SYRUP, BAKING SODA, SALT, SOY LECITHIN, ORGANIC VANILLA EXTRACT), ORGANIC RICE SYRUP, WHEY PROTEIN CONCENTRATE, ORGANIC NATURAL VANILLA FLAVOR, CAROB BEAN GUM, GUAR GUM. CONTAINS: S. THERMOPHILUS, L. BULGARICUS, L. ACIDOPHILUS, BIFIDUS AND L. CASEI LIVE ACTIVE CULTURES. I’ll be honest- I love flavored yogurt. I know, I know, too much sugar, blah blah blah but i just love it! Blueberry flavor always hits the spot for me, so i decided to try Stonyfield Farm nonfat Organic Blueberry Yogurt. Stonyfield Farms is one of the only brands you’ll find at your local Stop&Shop or wherever without high fructose corn syrup, artificial colors/flavors, and sweetners like aspartame. Granted they are a bit more expensive (usually a little over 1$ each), but they are definitely healthier. So i bought one of these, opened it up and gave it a stir. Creamy! Not runny either. Usually non-fat yogurt might as well be milk, being so runny and thin. But not this one. It was creamy and delicious. Sweet, but not overpowering. There were actual little baby blueberries in the bottom too-yum! My only complaint was that there was no fiber in the yogurt, but that’s expected. I remember they used to add inulin, and i wish that they still did. It would definitely curb my hunger a little better and make getting my fiber a little easier. Overall, I reccommend this yogurt over a lot of the other brands. It has 120 calories, 0g fat, 23 carbohydrates, <1 g. fiber and 7 grams of protein per cup. Plus 25% calcium needs. woo! Cultured Pasteurized Organic Nonfat Milk, Naturally Milled Organic Sugar, Organic Blueberries, Pectic, Natural Flavor, Organic Elderberry Juice Concentrate, Vitamin D3.